Jigsaw Jones Cover: Part 7, DONE! Our journey from concept to completion is done. Time for a Gatorade and a box of jelly donuts. (No, not really.) 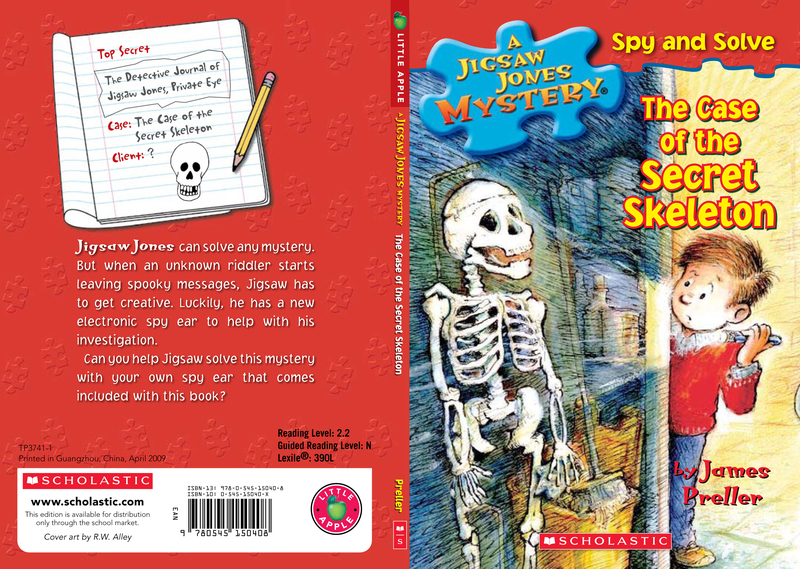 Below, please find the FINAL cover for Jigsaw Jones: The Case of the Secret Skeleton (Scholastic, Fall, 2009). Some links to the previous posts: One, Two, Three, Four, Five, and Six. Read them all and experience the awe and wonder of the creative, collaborative process! How’s that for bloggy investigative journalism? How could a traditional media outlet possibly compete with that level of detail? My thanks to Matt Ringler and Jen Rinaldi at Scholastic for their extraordinary openness, and to the great, gifted R. W. Alley for pulling back the curtain.